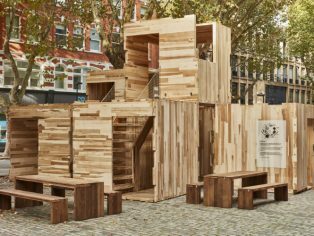 MultiPly, the carbon-neutral, modular wooden pavilion made entirely of American tulipwood that was the star of the London Design Festival, will have a new incarnation and a temporary home in South Crescent on London’s Store Street as part of a collaboration with New London Architecture. 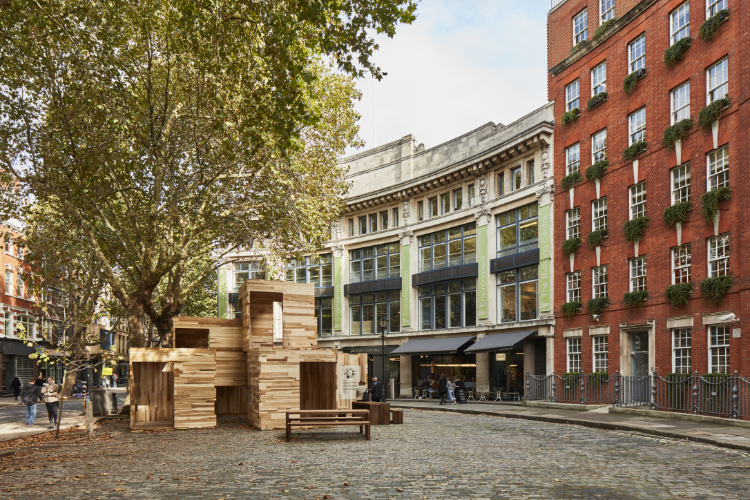 Six of the 17 modules of the original structure have been moved from their first home at the V&A and be rebuilt in front of The Building Centre for NLA’s exhibition ‘Factory-made Housing: a solution for London?’ from 6-21 October. The exhibition runs until 18 January 2019. 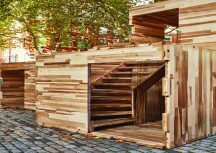 MultiPly is a collaboration between Waugh Thistleton Architects, the American Hardwood Export Council (AHEC) and ARUP, and illustrates how modular cross-laminated construction in hardwood is a viable solution to the current housing crisis. 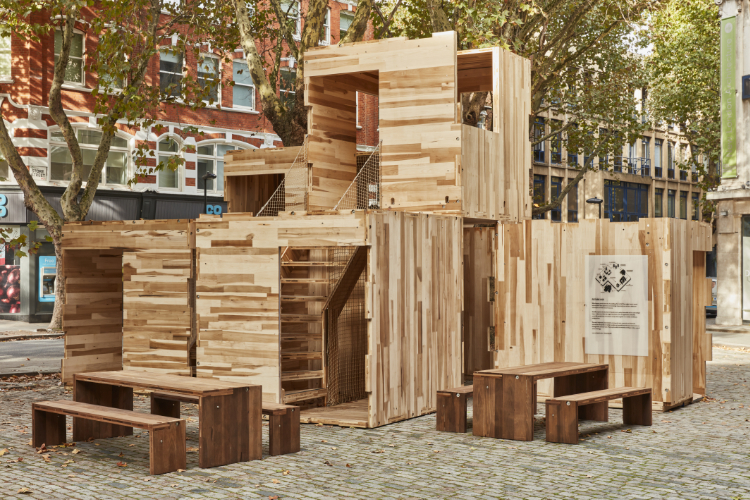 The structure is made with the first UK-manufactured cross laminated timber (CLT) panels. 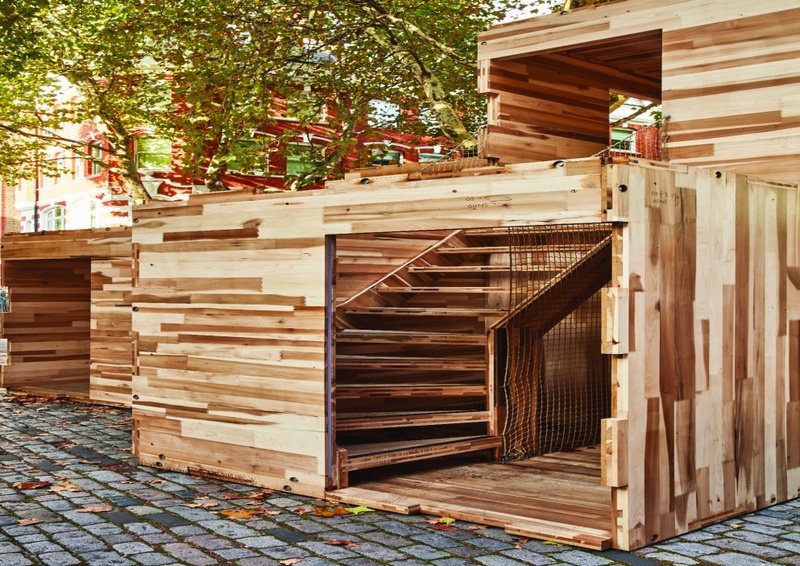 The 13m3 of tulipwood that make up this adaption of MultiPly store the equivalent of nine tonnes of carbon dioxide and are replaced with natural growth in the American forest in two minutes. The structure is comprised of a maze-like series of interconnected spaces that overlap and intertwine. It has been conceived and constructed to encourage visitors to re-think the way we design and build our homes and cities. The three-dimensional structure is built out of a flexible system, with digitally fabricated joints. 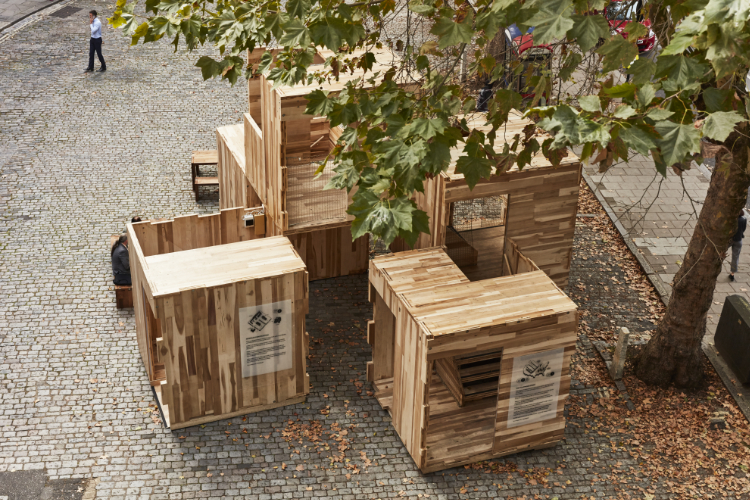 Like a piece of flat-packed furniture, the pavilion arrives as a kit of parts and is quietly and efficiently assembled. 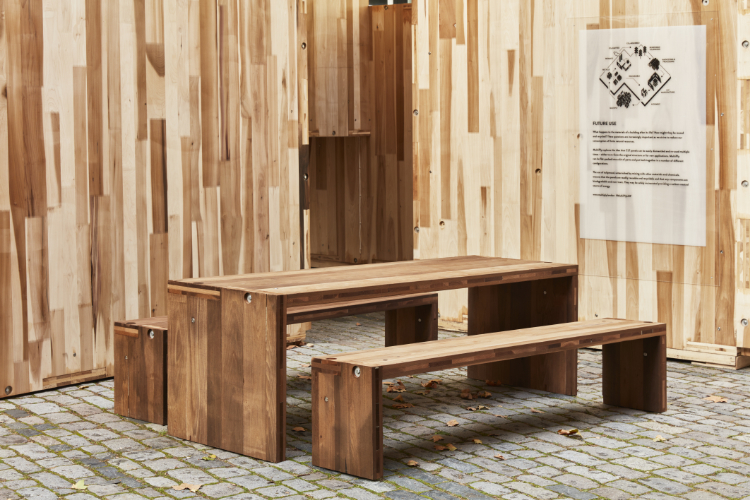 A set of benches and tables, made with thermally-modified American tulipwood have been placed around the pavilion. 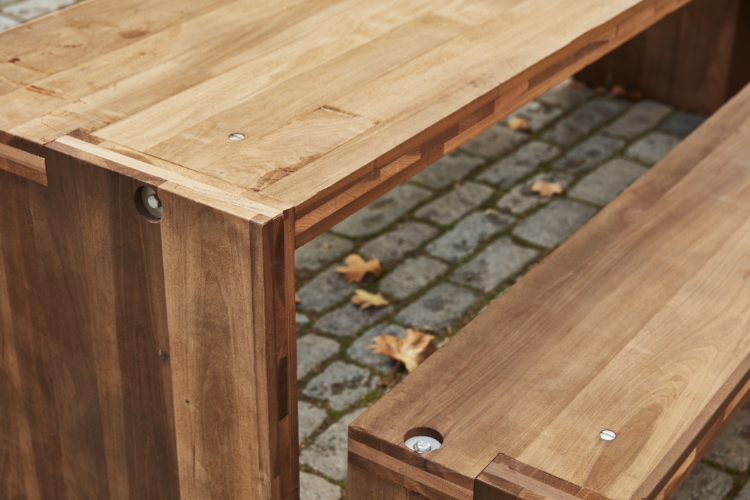 This timber has been modified by controlled heating, effectively crystallising the wood’s cambium and providing enhanced stability and durability. The process changes the appearance of the tulipwood, giving it deeper brown tones throughout and making it suitable for external applications. 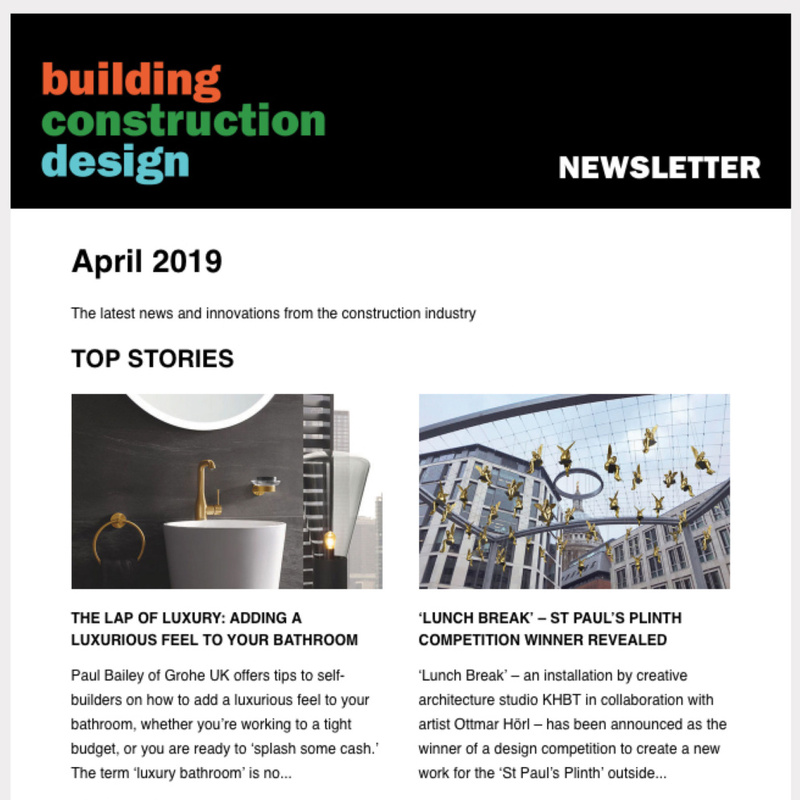 MultiPly confronts two of the current age’s biggest challenges – the pressing need for housing and the urgency to fight climate change and presents the fusion of modular systems and sustainable construction materials as a solution. MultiPly also challenges popular preconceptions about the aesthetics of prefabricated buildings, while retaining its essential attributes. It doesn’t look modular – that popular perception of the same old prefab box. But still, it is possible to dismantle it and rebuild it in a different form. To keep up with population growth and deal with years of under supply, around 250,000 new homes would need to be built in the UK every year. In 2016/17, 184,000 new homes were built in the UK, a shortfall of approximately 66,000 homes. To increase supply to meet demand, we must change the way we think and build. Tulipwood is sourced from the Eastern United States, where the hardwood forest area is expanding at a rate of one football pitch every minute, and already exceeds 110 million hectares, equivalent to the combined area of France and Spain. This makes the material both sustainable and environmentally friendly, especially as it is one of the most abundant American hardwoods – accounting for 7.7% of the total standing volume in U.S. hardwood forests. Every year, even after harvest, the volume of tulipwood in the U.S. forest grows by 19 million m3, the equivalent of over 19 Olympic swimming pools per day. MultiPly uses a wood engineering technique known as cross-laminating, where timber planks are laid perpendicular to one another and glued together to form very strong, stiff and stable panels. CLT has traditionally been made of softwood trees. However, together with Arup, AHEC have been experimenting with CLT made from fast-grown U.S. tulipwood for the past decade. 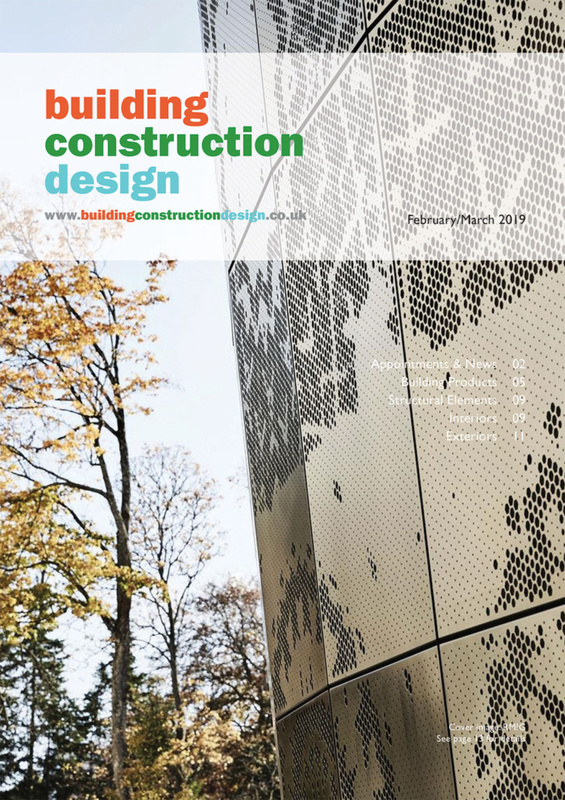 The research and projects undertaken have proven that weight for weight, tulipwood CLT is stronger than steel and concrete and can be machined to incredibly high tolerances. This makes it ideal for prefabrication and rapid assembly, reducing construction times by around 30%. Tulipwood is an inexpensive and easy to machine hardwood that is incredibly strong for its weight. marble-like appearance, make tulipwood a perfect pioneer hardwood for innovative timber construction. Tulipwood planks are imported from the U.S., but the panels for MultiPly have been manufactured in the Construction Scotland Innovation Centre (CSIC), the UK’s first CLT factory. MultiPly is the very first structure made from UK manufactured CLT. Modular housing is a modern method of construction that allows us to build homes quickly as most of the construction processes take place offsite. The efficiency achieved in a factory environment enables us to deliver good quality homes, quicker, thus minimising disruption to the local community. Modular timber construction offers a way to build more sustainably using renewable and energy efficient materials which have the unique advantage of producing structures that act as carbon stores during the lifetime of a building.